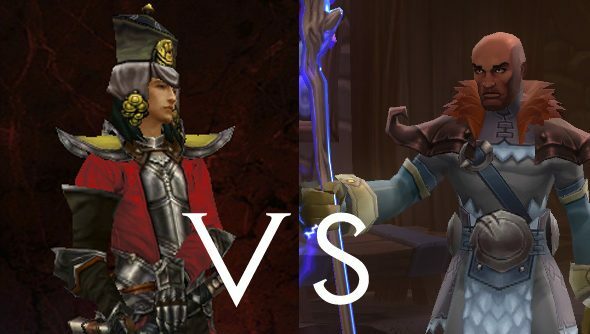 Torchlight 2 vs Diablo III: who clicks the best? It was always going to be like this. There was a lull, for a time, where the gulf of the ARPG was filled with your Titan Quests, your Dungeon Sieges and your Path of Exiles. But we always knew that Diablo was going to return, and we always knew it was going to be something big, and grandiose, and it was going to eat far too many hours of our time. Because it’s /just so compelling/ to click on the tiny men until they’re dead. But then Torchlight had to come along and be really bloody good, and now we’ve got Torchlight 2 coming hot on the heels of Diablo 3. Having spent a dozen hours with each, with Torchlight 2 in beta and Diablo 3 having been released, the similarities between the two aren’t as common as you might think. You’re going to be clicking on things, and exploring semi-random dungeons while grabbing every single thing that isn’t tied down, and destroying the rest in righteous anger at inanimate objects, but beyond that things start to get really deviant. 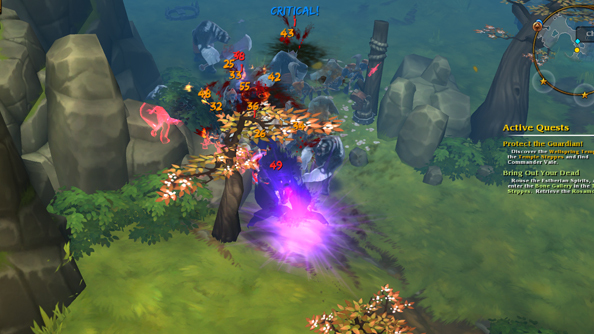 You can’t even rely on citing running back to base to offload your stuff because Torchlight had to go along have have pets to do that for you. The pets themselves are the most immediately original thing about Torchlight 2, separate even from how they worked in the first Torchlight. First of all there’s more of them, with humorous additions like Ferrets and Chihuahuas, more combat-appropriate new species like Hawks, Wolves and Panthers, and then the humorous and maybe combat appropriate Chakawary. Which I have no idea what is but looks a bit like a murloc with a backpack. More importantly, they now have more spell slots, and their own item slots in the form of collars and tags, all of which are directly tailored to making your pet more useful. 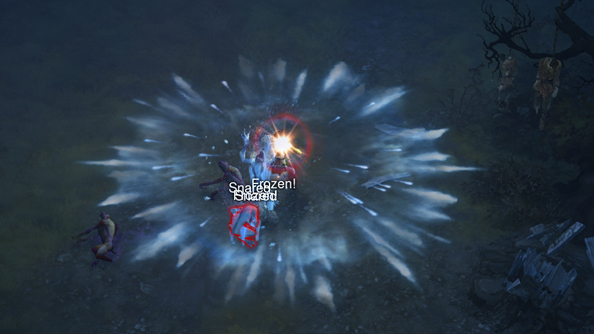 The way the spells work, too, has changed, with the active spells being far more useful on your pet, when they can occasionally fire them automatically, and new passive spells working well in your own spell slots, as you’re going to need all your hotkeys for all of your abilities. It’s not like Diablo 3 doesn’t have its own form of that, though. Throughout the game you come across Companion characters like the Templar or the Scoundrel, which act as surrogate team mates when you don’t have anyone to play with you. While they’re useful, and make playing solo a little less lonely, they are missing the one greatest innovation that Torchlight’s pets brought; running back to town for you to sell all the junk you pick up. When you’re playing Diablo 3, that’s by far the most frustrating element of it all. Maybe it’s an accepted mechanic, and maybe it’s there to provide frequent opportunities for breaks and just a moment to catch your breath, but having all those items on the floor when you slay a boss, only to have to /leave/ them there for two minutes while you port back to town and feverishly sell all of your tat is increasingly frustrating, the more you play. Even more so if you’re playing coop and your loot grabbing hasn’t quite synched with the rest of the party, and you’re headed back while they still kill. Even more commendably, Torchlight 2 has even revamped how the pet runs back, with you being able to place orders for potions and scrolls, further cutting down any down time between you and the denizens of hell, or whatever other Bad Place full of Bad People that you’re clearing out currently. It’s an interesting distinction between the games, because so much of Diablo 3 seems so severely streamlined to make everything between you and the actual moment to moment play of things as easy as possible. Town Portal scrolls are out, and instead you just have an infinitely-clickable button that ports you home. The skill system is also stripped down to the bare basics, giving you at most four options per type, and while those are further explored with the runes, it does mean that the opportunity for the player to screw up is almost nil. In Torchlight 2 you can probably quite easily screw up your character. At any one time, you’ve got at least seven or eight different skills to pump your points into, and while you can respec, it’s a costly endeavour. The thing is, it’ll be /you/ screw up, rather than just ending up with a skill that you don’t really like all that much when you level up. Playing both games, it’s this that separates them most, in the most general sense. Torchlight 2 gives you a lot of freedom, and while it doesn’t have the level of polish and sheer developmental /power/ that Blizzard have brought to bear on Diablo 3, it gives you a lot more credit for being an autonomous human being. You pick up a weapon and it doesn’t give you a cold, sterile breakdown of exactly whether it’s better to your overall damage rating, but rather just throws up big numbers and bigger special stats. And, crucially, when you equip them you’ll /actually use/ them to hit people with, rather than whatever default basic ability you use to generate spirit/mana/hatred/rage. Which is pretty great too. There’s no denying that all that polish does make a difference though. 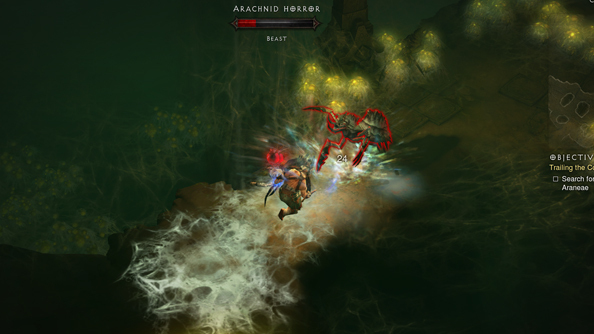 Hitting things in Diablo, whether because of the post processing or the physics, just feels /right/, and while Torchlight 2 isn’t exactly a slouch, there’s some sort of mysterious magic there that makes the tactile nature of punching something with the Monk just feel /better/ than whacking something with a sledgehammer as an Engineer. It’d be nicer if higher production values didn’t have as much of an effect as they do, but it really is incredibly satisfying to watch the Barbarian literally bash the flesh off a zombie, leaving it as a bloody skeleton. It was always going to be a case of subjectivity and personal taste, though. From what I’ve played, Diablo 3 is a much slicker, more linear and streamlined take on the genre that its predecessors made famous, while Torchlight 2 takes the idea and runs with it, throwing in new systems and ideas rather than taking out any that might weight it down. It’s maximalist development against minimalist, and in the end that’s what’s going to inform which one you want to spend your time clicking on. Personally, I’ll be playing Torchlight II tonight.